Manure storage structures are an integral part of livestock feeding operations. They allow for manure containment until conditions are favorable for land application or other treatment. Manure may be stored in enclosed structures, near or directly below the animal housing facility or it may be stored in open structures such as above ground tanks or storage ponds/lagoons. 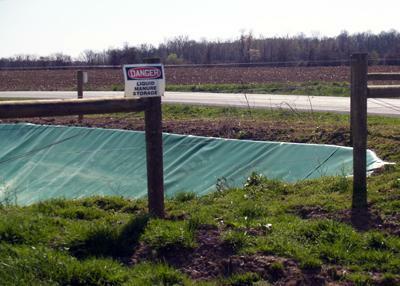 A sign like this “Danger: Liquid Manure Storage” should posted for all types of liquid manure storage, enclosed or open. Consider posting this message in other languages if there are non-English speakers living or working on or near the farm. Hydrogen sulfide is the greatest danger to humans in enclosed manure storage areas. It has a characteristic “rotten egg” smell and is heavier than air, so it tends to collect in the lower levels of a structure and in corners of the storage area where air circulation is least available. It quickly desensitizes the sense of smell so that a person does not detect greater levels of the gas after breathing it. It can be rapidly released when manure is agitated. At low levels (10 ppm) it can irritate the eyes. Death can occur when it reaches levels of 500 ppm or greater. Ammonia has a distinctive, sharp odor and is heavier than air. It becomes irritating to humans at around 50 ppm. If it reaches levels of 1000 ppm or more, it can be deadly, although most people are so uncomfortable at this level, they usually seek relief by leaving a building before it reaches dangerous concentrations. Prolonged exposure to high ammonia levels can also impact animal performance. Methane is a concern because it is potentially explosive at levels above 50,000 ppm. It is lighter than air and odorless. In the fall of 2009, enough manure pit-related fires and explosions were reported to attract renewed attention to the safety concerns related to gas buildup. Other potentially explosive gases produced by manure decomposition are hydrogen sulfide (H2S) and phosphine (PH3, but both become lethal to animals and humans at concentrations far below that required for ignition. A literature review by Iowa State University (supported by the Pork Board) provides additional information on this topic. Deep Pit Swine Facility Flash Fires and Explosions. In a properly designed anaerobic digester, methane production can be enhanced and possibly captured for use in electrical generation. For more information see Introduction to Biogas and Anaerobic Digestion. Carbon dioxide is odorless, but can cause asphyxiation if it displaces enough oxygen in the air. It is heavier than air and tends to accumulate in the same areas as hydrogen sulfide. This manure storage structure is fenced and has a life preserver in a prominent location. The concrete ramp by the gate provides an easy escape point for humans and wildlife that fall into the pit. Note that this fencing will discourage entry but will not prevent a determined child from exploring the pit. If young children live on or visit your farm, a chain link fence will provide a higher degree of deterrence than multi-strand wire fences and gates such as this. Open manure storage ponds or above ground storage tanks also pose hazards, the most obvious of which is drowning. A storage pond may form a crust on the surface that appears solid and capable of holding a person’s weight. Unfortunately, this is not always the case. Children are also at risk of drowning in these structures and safety considerations must always include ways to prevent access to these areas, such as fencing, gates with locks and outside walls on concrete structures that preclude easy entry. likely scenario is that one of the three fell into the pit and the other two died trying to rescue him. University of Illinois Certified Livestock Management and Commercial Manure Haulers program. 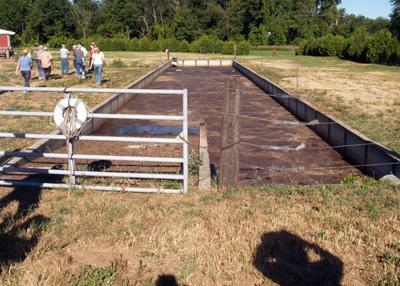 Manure Pit Safety from Pennsylvania State University contains a great deal of current information on safety hazards associated with manure storage.